Former GUNS N' ROSES guitarist SLASH and vocalist AXL ROSE had a little exchange of words via Twitter. Earlier this evening Slash tweeted, "Looking into organizing a big fund raiser concert for Haiti." 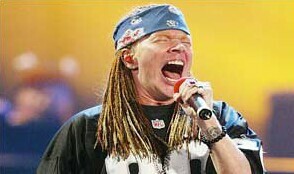 Axl subsequently replied, "Pretty low n' selfish usin' the devastation in Haiti 2 start (false) reunion rumors. R hearts n' prayers go out to the Haitian people."